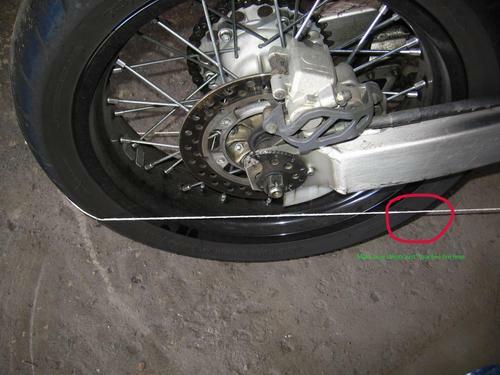 Aligning motorcycle wheels when adjusting the chain is simpler than it sounds. All you need is a string that is about three times longer than the wheelbase and two weights to hold the string tight. In my case I've used two old cam belt bearings from my Impreza. I have yet to see a swingarm that has accurate chain adjustment marks. The wheel always ends up being skewed to one side. The good thing about motorcycles is that even if the rear wheel is not perfectly in line with the front wheel, it'll still be rideable. The difference having good alignment makes is longer tire life as well as a decreased tendency to exhibit head shake. You may also notice on some bikes that you feel more comfortable making left turns than right turns or vice versa, and can't quit figure out why. It could be rear wheel alignment. Left and right turns will feel different if the rear wheel is tracking off to one side. First, get the motorcycle to stand up as straight as it can. Put spacers under the kickstand, or put it up on the center stand, or track stands. Now, tie your weights to the end of the string. Next, take your string and fold it in half to find the center point. Tape it to the rear tire at a height that will allow it to clear everything under the motorcycle.. exhaust, saddle bags.. etc. when pulled directly forward towards the front tire. Pull the string forward toward the front of the bike and place the weights on something that is about the same height as the tape on the back tire. Next, adjust the strings so that they just touch the front edge of the rear tire. You want the string to still be straight, but just brushing the tire in the location indicated in the next picture. Adjust your chain as you normally would, but before tightening the axle, use the string to check your alignment. Adjust the strings so they just touch the leading edge of the rear tire and then measure the distance between both strings and the outside edge of the front tire. You want both left and right sides to measure the same distance. You want all 4 points on the front wheel where the string comes closest to measure the same distance. This will ensure the front wheel is pointed directly ahead and that the rear wheel is centered with the front wheel. Tighten up your axle and double check the measurements. Occasionally the axle tightening will skew the back wheel a bit. If it does, simply loosen and adjust the chain adjusters to compensate for the amount of skew introduced by tightening the axle. Make notes of your measurements, or.. create new marks on your swingarm that are accurate. You're done. Go riding.